You can follow link alexa with a user in your system guide to setup multiple users with your guide. CDC has recently classified insufficient sleep as a public health problem. Sleepiness is the root cause of increasing the risk of accidents and other occupational errors. It can also cause health concerns such as diabetes, depression and high blood pressure. According to a recent survey by the National Sleep Foundation and the Consumer Electronics Association, more than 60% of sleep tracking technology owners are more aware of their sleep patterns after sleep tracking. 51% of sleep tracking technology owners say they’re sleeping better knowing the technology is helping them and 49% say they feel healthier since they started using the technology. Although most of the sleep tracking technologies are non-invasive devices such as watches and bands, they still require huge amounts of daily maintenance for hygiene and constant battery charging. The discipline of frequent charging and hygiene maintenance using the wearable device has turned a lot of people away from using them. Using Walabot, we can build a non-invasive sleep tracking system that's always on. This way the User does not have to worry about charging their wearables, washing for hygiene and still be able to track a good night's sleep. Walabot can be used on any Linux or IoT machine; in this case, we will be using a laptop as the base. We will also be implementing AI locally, as well, to identify the patterns to the user. 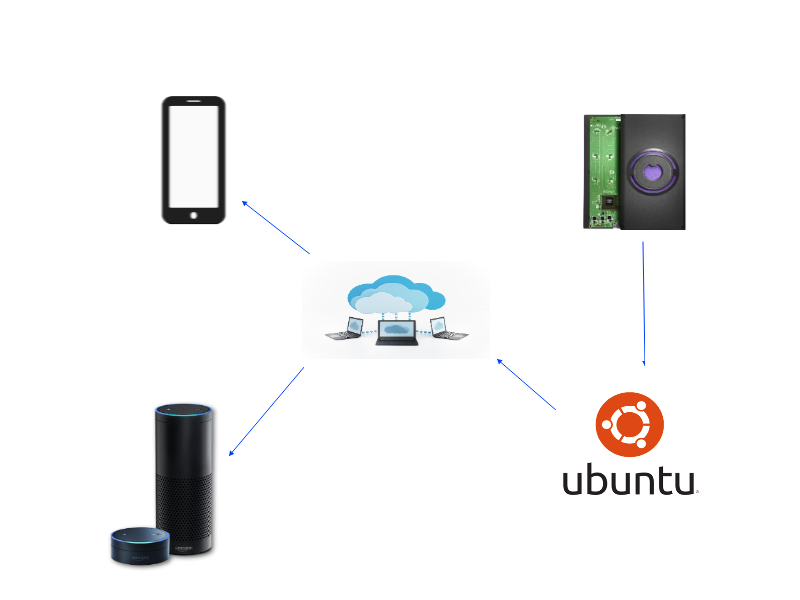 Walabot server will be used to store the information; this can be used to display extra information for mobile devices, IoT display devices, as well as Alexa. Alexa is one of the many output options that we can use; in this case, it's the easiest one to implement and get a quick glimpse about how your night sleep was. We first have to setup Walabot. In this case, we are detecting the amount of energy being used while asleep. We've based this off the breathing example, as it seemed Walabot was very effective at detecting not just movement but how much energy was being used through the movement, making it perfect to track sleep. We can build this with any IoT device that runs Ubuntu and Python such as Raspberry Pi, but for this prototype's case, we are going to use a cheap laptop because we have a screen that can monitor what's going on. from __future__ import print_function # WalabotAPI works on both Python 2 an 3. In order to track sleep over time, it's a good idea that we we store the data in the cloud. In this example, we are setting up a simple file storage in a file, but in the future we can store that into mongodb. For this example we will be using node.js and host through heroku. Once server is setup, use the following code attached as your base. You can choose to host on other places such as Amazon, Azure, or IBM Bluemix; this is just a quick example to spin up the server. Let Walabot update the sever once it reaches the threshold. Lambda hosts a serverless function which Alexa can interact with. Create one empty one using node.js instead of following the guide. We can copy/paste the Alexa node.js code from below. After creating the function, we would have the ARN number. Write it down so we can use that in configuration for the Alexa Skill kit. We would also have to add the Alexa Skill kit into the sleep tracker - copy and paste the entire node.js code. The intelligence right now is hosted in Alexa and it checks for moving around vs. moving a lot, such as getting up. This way we can take the off loads from the server. Now you can test your Alexa skill by asking "Alexa, ask Sleep Tracker how was my sleep?" We can do machine learning on how well the sleep is rather than writing our own algorithm. That will be done in the future. var cardTitle = "Welcome to Sleep Tracker"
var speechOutput = "Welcome to Sleep Tracker"
This is the Ubuntu Python code, including the plot as well as server update. This is the github repo for all the code on this project, feel free to recreate entire project using it.